Currently, in contemporary architectural theory, there is an ongoing debate about the purity and relevance of the term tectonic, which has re-appeared sporadically throughout the history of western Architecture. As a generic umbrella for the term, all of the readings of the word in question seem to share the idea that the tectonic represents an ineffable quality of visual synergy between the needs of construction and structure with the harmonious visualization and pronunciation of those needs. This course will interrogate the relevance of the concept of tectonics via the design and construction of complex surface geometry in terms of subdivision and panelization, articulation and structure. Is the continual subdivision of higher gaussian surface curvature into smaller panels a tectonic expression or merely a construction issue? Do the compressive structure lines within a developable surface that hold its shape inform a buildings tectonic or is this made irrelevant when scaling a paper model to the size of a building with manifest panels? Is the U+V grid a tectonic expression by means of the re-production of the virtual domain in which it was created? Or as in the roofs of gothic vaults in a more traditional sense the visualization of forces directed to the ground that suspend complex surfaces in the air the true tectonic? 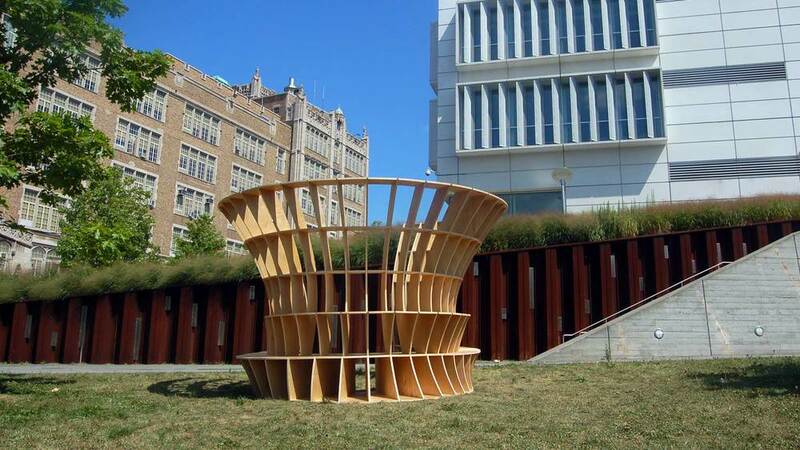 In the Summer of 2014, Students of the Spitzer school of Architecture at City College New York, undertook the design and fabrication of a pavilion to examine these questions within the framework of a built project. The design unfolded surrounding the realization of complex negative gaussian curvature of hyperbolic surface geometry, specifically the hyperbola of revolution. In the design for a bench and seating structure the negative gaussian curvature of the revolved surface provided additional canopy above this seating as it bent outwards from the inner hemisphere of the seating ring. Three tangential elliptical hyperbolas were nested together, one for the canopy, one for the seating surface and one for a raised display surface, allowing for a smooth oscillation into an asymmetric form. The radial egg-crate structure was chosen to serve as both a series of display cubbies for books and projects, but simultaneously to reinforce the modular assembly process. The Pavilion, features a system which allows for quick assembly and dis-assembly due to its clever use of woodworking joinery principles and mechanical fasteners. The 20 vertical ribs are broken into 10 structural bays, that are pre-assembled and can be carried to the site in question and then re-deployed. The seating and display surfaces feature a locking joint system, with a bezier curve overlap that allows for quick deployment. The project was celebrated by the students and faculty of the school and is currently on display on the third floor of the Spitzer School of Architecture's Atrium.